Here, submitted for your viewing pleasure, is my newest tiny crochet. 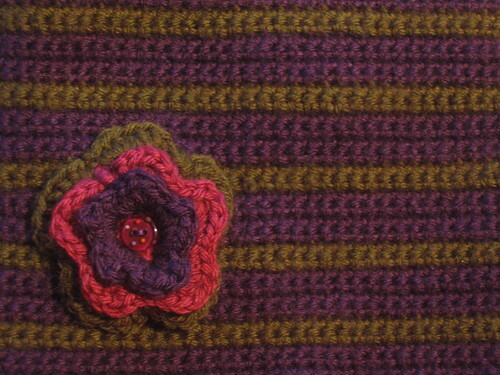 This is a flower, created to prettify a sweater with poorly chosen colors, and it worked! The pattern is online somewhere, just a flower, but I switched colors for each round to get the multi-layer effect. sweet flower………would love to see it on the sweater! I like the colors. Cool. Great save with the flower – I think the colours might be a bit masculine for a girl without it! Amazing what a tiny splash of pink will do! Thanks I thought so too, June… it was meant to be springy, but ended up kinda drab. The buttons helped too!